February marks the fourth consecutive month the gap between owner estimates and appraiser opinions of home value has widened, although the difference is still small at a national level. Appraisal values in February were an average of 0.5 percent lower than what homeowners expected, according to the National Quicken Loans Home Price Perception Index (HPPI). Home value perception continues to vary at a metro level, but remains in a relatively tight band. Of the metro areas that had average appraisals lower than expected, none of them were more than 2 percent lower than the owner’s estimate. At the other side of the spectrum, Boston is the outlier with the average appraisal 2.51 percent higher than what the homeowner expected—which could add more than $11,000 in equity based on local median home prices. Charlotte follows closely behind, surprising the average homeowner with an appraisal 2.1 percent higher than what they estimated. In total, 62 percent of the metro areas are reporting average appraisals higher than expected. Home values were practically frozen in the height of winter. 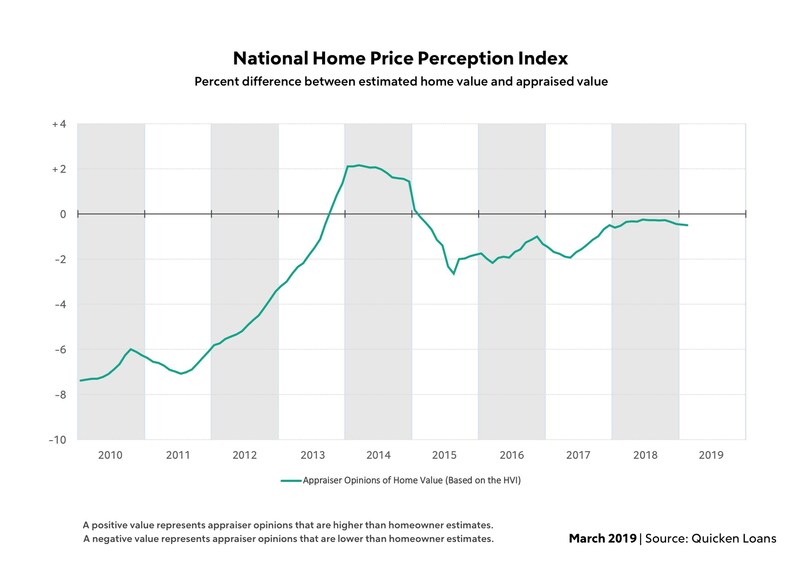 The National Quicken Loans Home Value Index (HVI), the only measure of home value changes based solely on appraisals, reported the average appraisal increased a mere 0.05 percent in February. Annual growth continues to be strong, with year-over-year growth of 5.47 percent—increasing at a higher clip than in January. The regional appraisal changes are a mixed bag. No region saw appraisal values swinging more than half a percent in either direction. Appraisals were an average of 0.33 and 0.5 percent higher in the West and the Northeast, respectively. However, values dipped 0.25 and 0.56 percent in the Midwest and the South. On the other hand, all regions have year-over-year growth in common, ranging from a 3.72 percent increase in the Midwest to a 5.6 percent jump in the West.